Hi everyone! Hope you had a nice weekend. 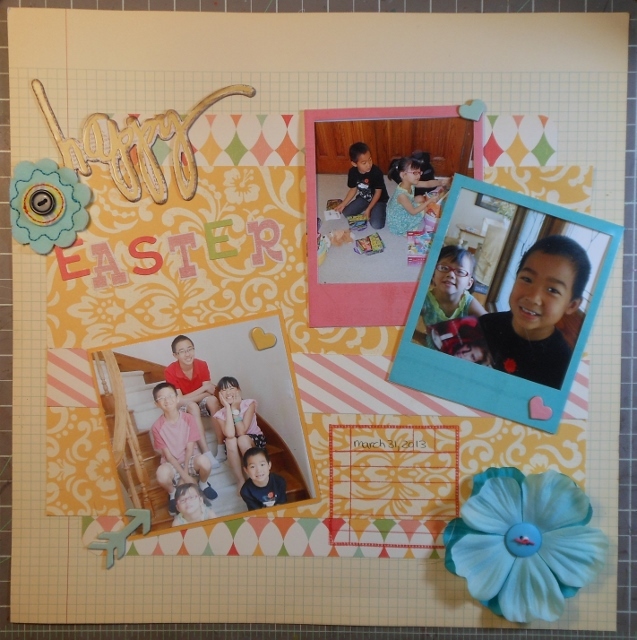 Here is an Easter layout I made using the sketch challenge at Sketch-n-Scrap. 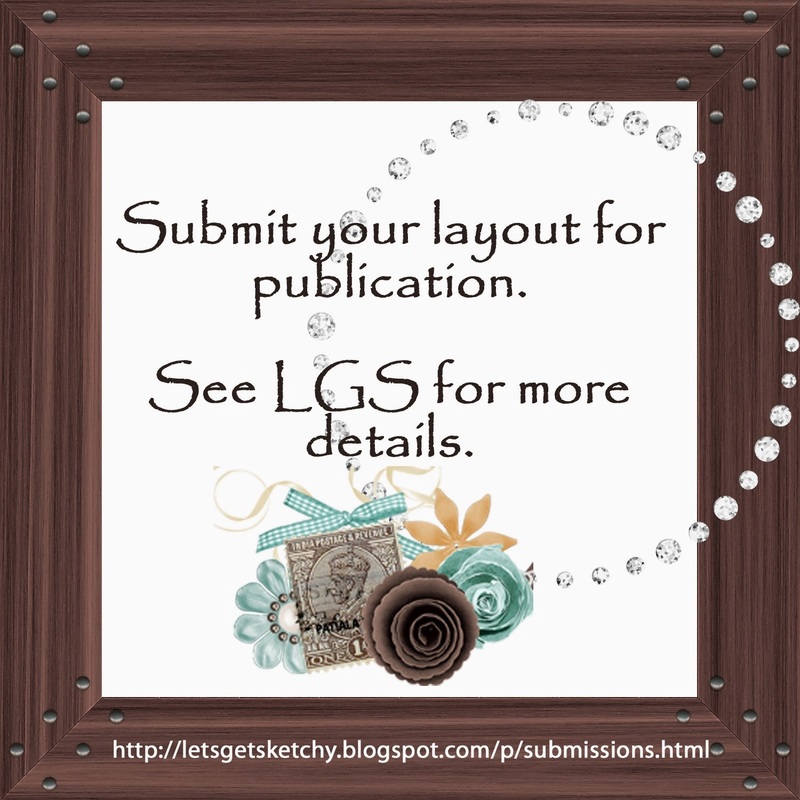 I had fun combining it with a fun Guest Designer challenge from Brenda at Sketches4all. 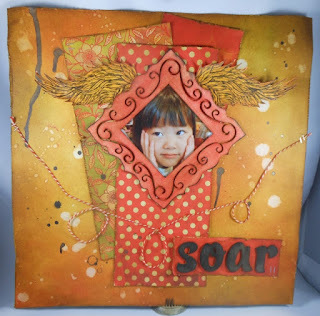 Her challenge was to use a Polaroid, mixed alphas and at least 3 patterned papers. This meets both challenges. 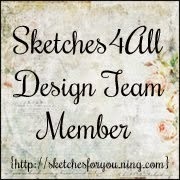 Stop back by Monday for the Sketches4all Blog Hop and Scrap A Thon. It is going to be fun!! Have an awesome day today!! 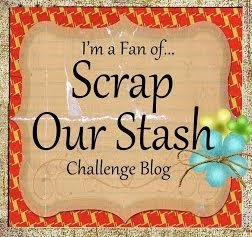 Be sure to stop over at Sketches4all tomorrow for our blog hop and scrap a thon!! There will be fantabulous prizes offered that you won't want to miss out on!!!!!!!!! More info here tomorrow. Yes, it's true. 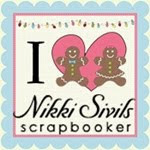 I went to my first scrapbook store crop on Saturday and had a lot of fun. I made 5 layouts (mostly finished, just need to add photos) and 2 cards. Right now I am just going to show you one of the cards I made. I really like it a lot. When I first got to the crop I couldn't figure out what I wanted to make so I decided I needed a little retail inspiration (shopping - lol) so I wandered the store until I found some paper I liked and bought it. Then I went and started making a layout. After I made the layout I decided to use my scraps to make a card. Here is the card. I love this card. The paper is from Bo Bunny - Prairie Chic collection (I'm pretty sure). I saw the "banner" pattern on one of the paper sheets and thought it would make the perfect banner type shape for my card. 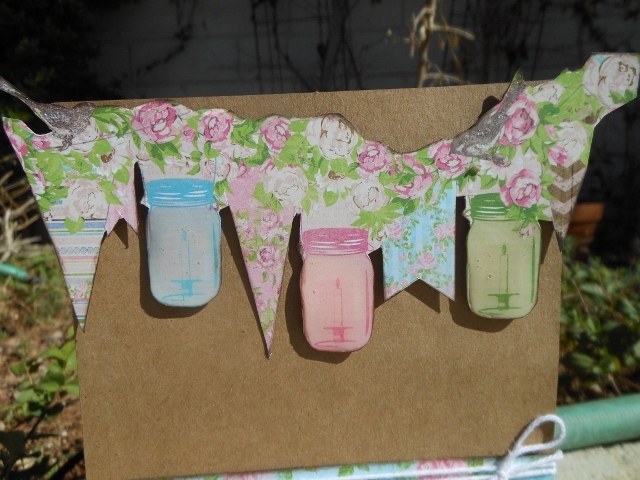 I cut it out with my scissors and added glossy accents to the mason jars to make them look like they were glass. All the other papers on the card were just scraps from my layout. 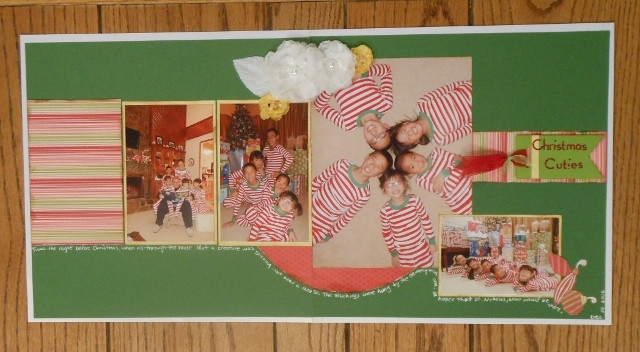 I used a Bo Bunny sentiment stamp that I stamped onto a piece of scrap paper and then cut in a banner shape. A little bit of twine to finish...voila! I will be sharing more with you soon. I made that butterfly 3d embellie on the upper left side of the page by punching out two butterflies from glitter paper, gluing them together at the body and folding up the wings on the top butterfly. I grabbed some green decorative pins from Maya Road and painted them black. I trimmed off the extra straight pin part and used them for the butterfly's antenna. I colored some clear bling with my black Spectrum Noir marker and glued them down on the body of the butterfly. We were required to use quilling on the layout too. 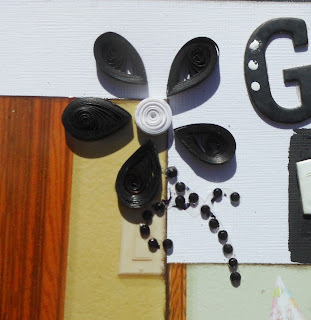 I have never quilled but I did have some quilling stuff that I got for "free" with a scrap magazine that I used. I watched a tutorial on YouTube on how to do basic quilling and then I went to town making a flower. I think it turned out okay for a first try. I tried to use a stencil and some paint as part of my title work but it ended up being a big mess so I just painted over it and changed my stenciling plan. ha Instead of paint, I used some Black Magic Glimmer Mist to stencil on the project. That worked out much better. And in addition to painting the ends of the decorative pins, I painted the chipboard alphas for my title too. They started out being green and brown. For my swirl requirement I pulled out my Sheena Douglas A Little Bit Scenic - Flying Colors stamp set. I stamped out the swirl stamp with my Memento Tuxedo Black ink and then added a few small punched butterflies. I think it turned out okay. How about you? Here is a video of a couple of my kids dancing if you want to take a look. They think they are hip hop dancers. Labels: Crafter's Companion, Sheena Douglas A Little Bit Scenic - Flying Colors stamp set. 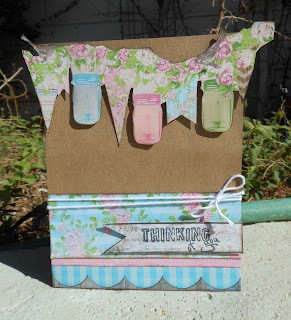 Have you joined in on the March "Vintage" Challenge at Crafter's Companion this month? 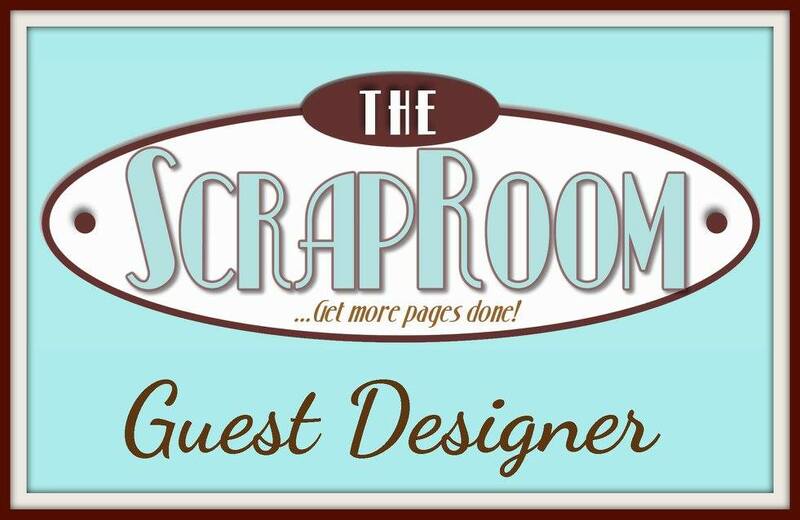 If you haven't there is still time to join and be in the running to win the $30 gift card to the Crafter's Companion store! I stamped out my sentiment from Sheena's A Little Bit Sketchy Stamp Set - Always Floral with Memento Rich Cocoa ink onto a sheet of Ultra Smooth Premium White Card stock. Next I sprinkled on some clear embossing powder and heat embossed it. I pulled out a couple of dies and my eBosser and cut out the sentiment and a mat. While the sentiment was still inside the die, I inked over the image with Ranger Distress ink in Brushed Corduroy. This gave the perfect little frame around the edge of the sentiment. Next I pulled out two complimentary pattern papers and distressed and inked the edges. On one of the papers I grabbed the swirl stamp from my Sheena's A Little Bit Scenic - Flying Colors and with Scattered Straw Distress ink, stamped parts of the swirl on a couple of the corners. 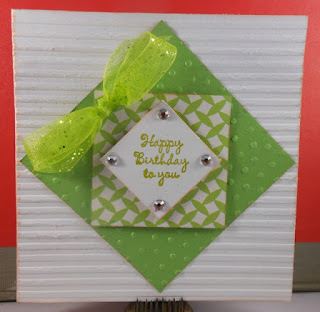 And then I took out my Darice 5" X 7" Embossing Folder - Dot Background and embossed the green patterned paper. It doesn't show well in the photos but it give nice texture. After that I just had to put all the layers together. 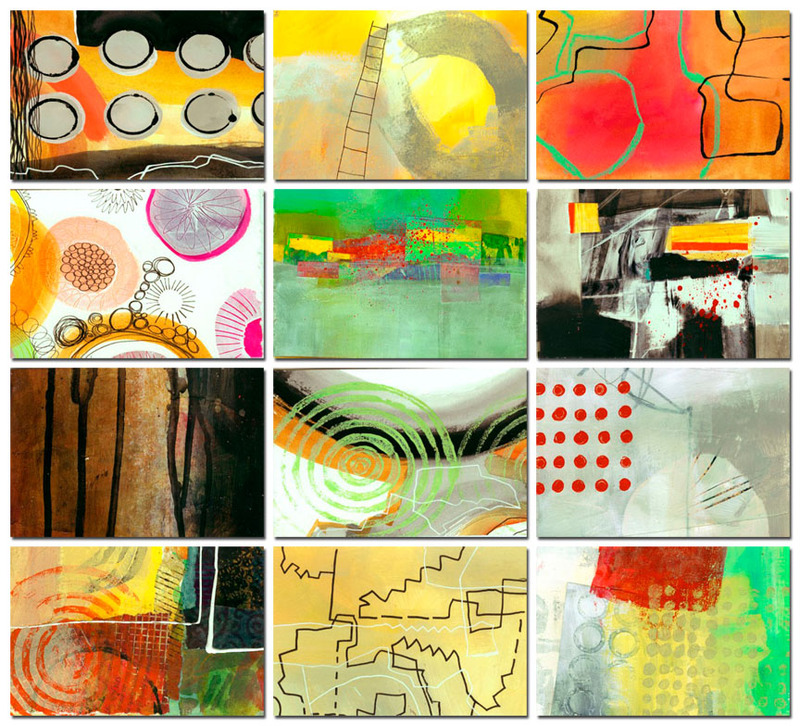 I worked from a sketch challenge at Try Stamping On Tuesday. I turned the sketch and took off a piece because it wasn't working with my topper. 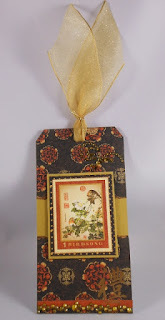 I popped up the sentiment with double sided adhesive squares to give a bit of extra dimension. I used the same Distress ink to color some white ribbon from my stash to make my bow. I finished the card with 3 pearls. We have Spring Break coming up next week and I'm getting very excited!! lol My bestie and her family are coming in to visit for the first 4 days of our break and then my mom will be in town for a couple of weeks. We are all excited by our upcoming visitors and our break time. Thanks for stopping by today and looking. The hardest part for me is finding 4 photos that are good that go together. That is probably a testiment to my poor photography skills. I can ususally get 1-2 good photos that work together but more that 2 is a stretch. And these have to be in black and white. I finished up my layout from last week (the one above) last night with 30 minutes to spare! LOL No stress or anything. I'm not sure if I think it is finished yet though...it worked for the challenge but I might add a couple of things to it...what do you think? 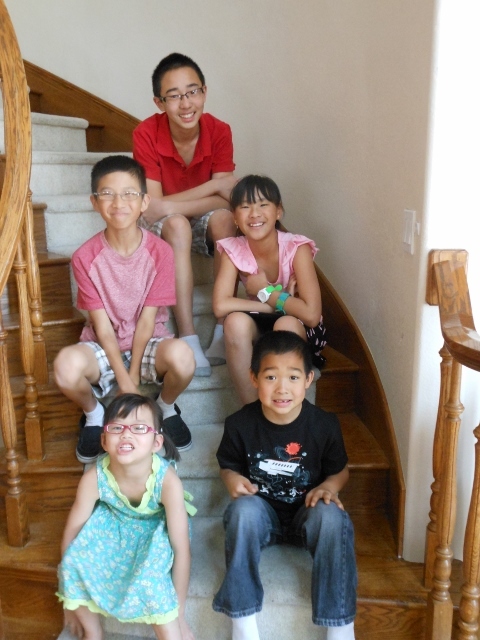 My daughter is 2nd from the right. Totally different subject...my daughter has been practicing for months on the musical - 101 Dalmations. Opening night was last night and she did a fantastic job!! I'm so happy for her. She has a performance today at school for classmates and another one tonight and tomorrow night. 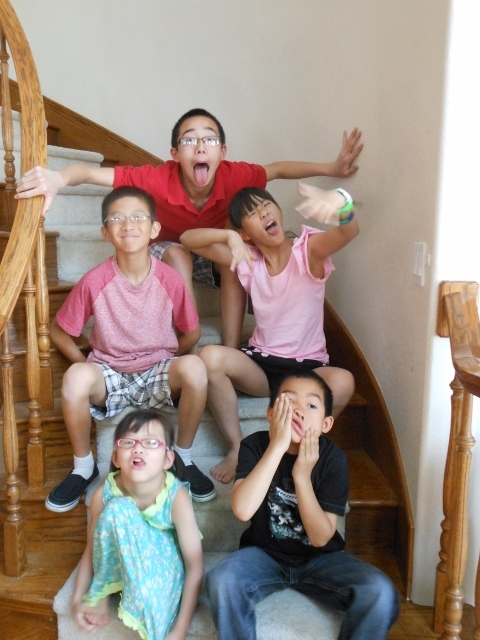 We are taking our whole family tonight. Last night it was only me that was able to go because of the other kids being in other things. 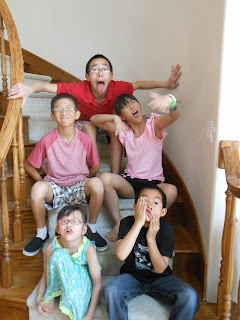 Who's tired this morning besides all of my kids? ha Daylight Savings is not making it a very nice morning around here. But they will adjust eventually. I have a couple things to share this morning. I have a card I made for Cheryl's Green challenge at Sketches4all. I took the sketch from the challenge at Feeling Sketchy (although I'm too late to enter it in their challenge). 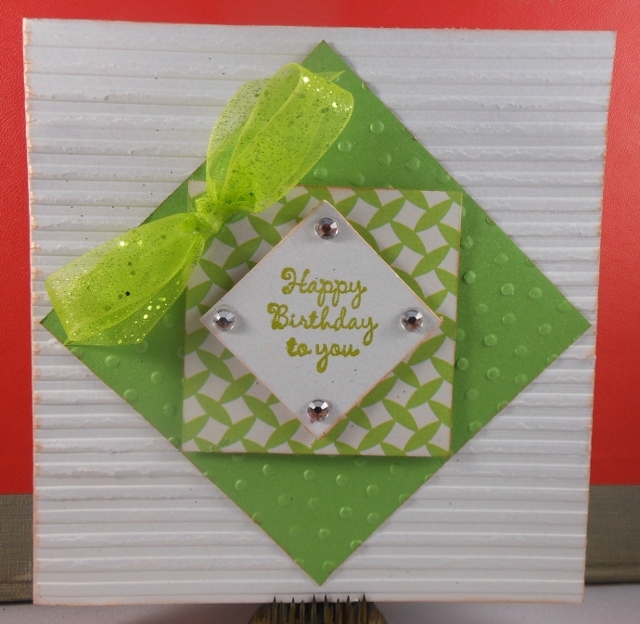 I plan to enter it in the birthday challenge at Little Scrap Pieces. This is a very CAS card. 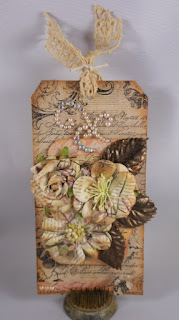 I tried to give it some texture by embossing it with a couple of my Darice embossing folders. And the sentiment is from the Stamp It Imagine - Sentiment Swirls stamp set from Crafter's Companion. For some reason yesterday, I was pretty good at making quick projects. My mind didn't really allow for any long complicated projects. 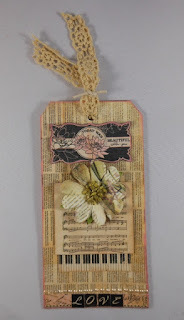 Ha Here is a tag I made for the Happy Friday weekly challenge at Sketches4all. The challenge was to use a sketch and to use the color gold. Here is a tag I made for the Flower challenge at Sketches4all. 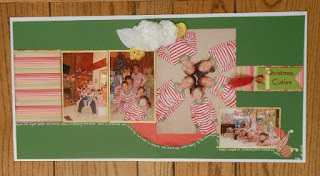 I used Prima goodies on this and the next project. I have to run the kids to school so I will end here. Enjoy your Monday! 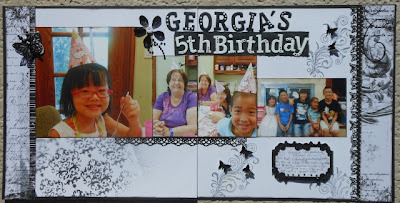 Look at the layout I made using the new Sheena Douglass - A Little Bit Sketchy stamps. I had this wacky idea of framing a photo of my daughter's head, stamping out the wings from the Divine Inspiration set in this collection and attaching them to the outside of the frame. So that is what I did. I started out by inking a piece of Luxury Centura Pearl 12" x 12" Printable Snow White Card Stock with Ranger Distress inks in Barn Door, Mowed Lawn, Brushed Corduroy and Spiced Marmalade. I worked on the non-shiny side. I distressed the edges and splattered on some Glimmer Mist in Black Magic. Then I pulled one of the new stamps from the Ageing Beautifully set and stamped the two little circles on this paper. I stamped out the wings and colored them with my Spectrum Noir markers using GB5 and GB11. Then I fussy cut them out and added them to the inked and framed photo of my daughter. 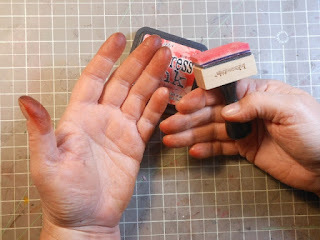 I layered my patterned papers after distressing and inking the edges. 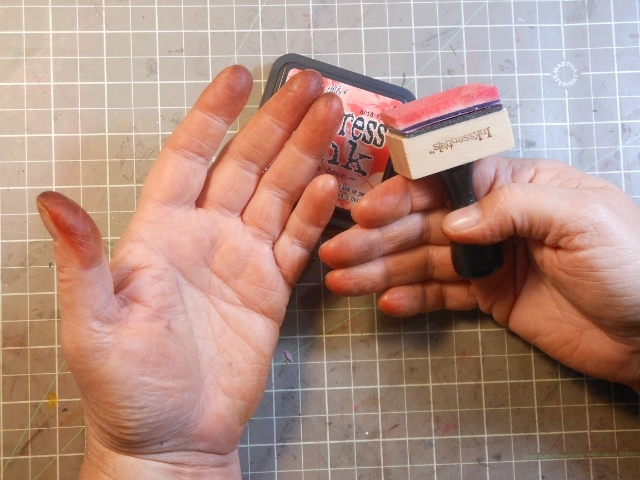 As you can see this was a great way to get my hands messy because I inked literally everything that is on this project! ha I finished it off with some randomly placed bakers twine and wooden alphas from my stash spelling out the title of SOAR. 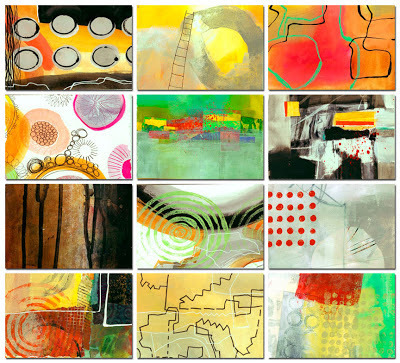 Not only will these new stamps from Sheena make beautiful cards but they will also be perfect for mixed media projects. And lucky for you, they are available today at Crafter's Companion. Go check them out! Please read the post below and see if you might be able to help out Jane. 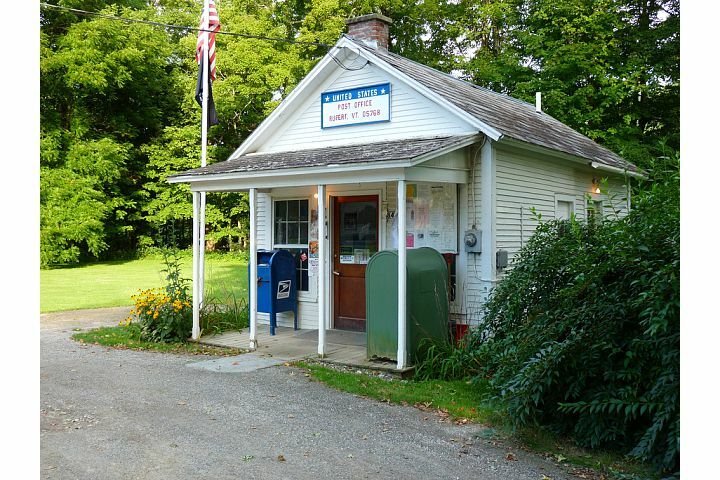 She is fighting to keep the her small post office open in Rupert, Vermont. Your postcard to could make the difference. I know I'm working on one to send to her!!! Crafter's Companion is launching a new collection of stamps on Wednesday called Party Paws. This collection is just the cutest! Each stamp features Bamboo the panda bear. 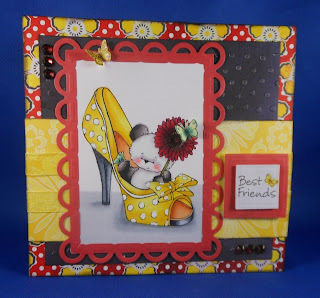 Here is the first stamped image I colored made into a best friend card. Bamboo is sitting in a shoe! How adorable is that? I'm really loving the color combo of red and yellow right now so I pulled some patterned papers in these colors from my stash to start. 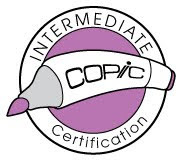 I embossed one of the papers with my Darice Embossing Folder - Dot Background for some added texture. Then I layered the papers on the card base. 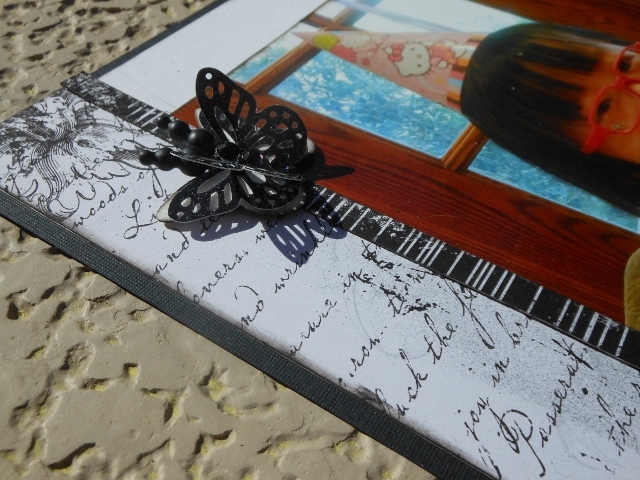 After I colored the image and the butterfly on the sentiment, I die cut them both out on my eBosser and then added them to my card. 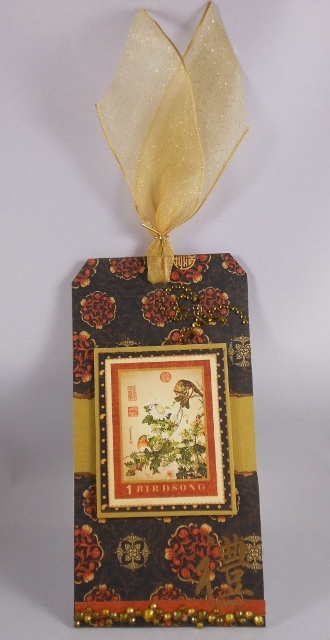 I added a bit of ribbon, some bling and a few extra butterflies from the same stamp set to finish. 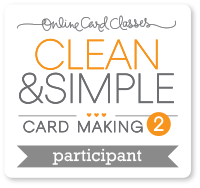 I plan to enter this card over at Docerela Creations - Friendship challenge. I think it is a bright and happy card. I hope you like it. It was fun coloring Bamboo and I bet you will want to do it too. 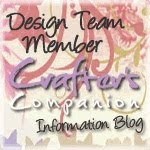 Go check out this new release at Crafter's Companion.